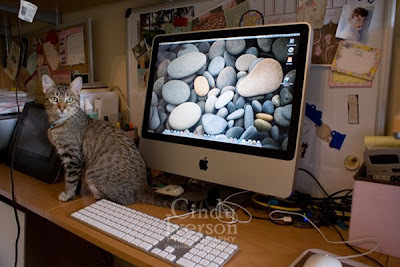 In a comment on the last post, Kylee over at Our Little Acre requested a picture of the new iMac. Well, I never want to disappoint Kylee... so here it is! Lucy is helping to model it. That's a 20-inch display in case you're wondering how big Lucy is in comparison to the iMac. Yeah, she's still a petite little thing. And so is the new Apple keyboard at less than 17 inches long. It's all pretty snazzy and exciting. I've been reading a book I got by David Pogue about switching from a PC to Apple's operating system called Leopard or OS X (that "X" is the Roman numeral for "10"). Here's a cool little tidbit I read yesterday... the Leopard operating system is Unix-based and that's why it's so stable as well as resistant to viruses and spyware. In fact, it is based on the NeXT computers that Steve Jobs worked on during the years he was away from Apple. I'm running Fusion's VMware (in fact I'm typing this in Windows Explorer right now on the iMac) so I can flip back and forth between Windows XP and Leopard (Mac OS X). Pretty nifty! I'm still learning the in's and out's of file-sharing between the two operating systems, but considering I was able to figure out how to move the above photo from Windows XP to Mac OS X and then back again without opening a manual says something for the user interface and how intuitive it is. All in all, I'm extremely happy! I did a test-run of the HP Scanjet G4010 that we got this spring for scanning my illustrations and paintings so I can create multimedia art pieces. I was so happy with the result I jumped up and grabbed Hubby around the neck and continued jumping up and down. The scan was so beautiful and perfect. I wish I could show it, but I can't share that yet because I'm still in the creative stage of that piece and don't want to spoil the fun. I feel like I've discovered the best kept secret in the computer world. All those PC users that think they'll lose flexibility and control or think they're "dumbing down" by acquiring an Apple just don't know what they're missing. I love it, I love it!! I have an imac too!! Very cool (as my sister would say)! My word, isn't Lucy big now!?! Love the background of the pebbles too! Beautiful! Sublime design! Perfectly proportioned! I have to say, it looks beautiful! Good to see Lucy again, too. My husband was just telling me the other day that we should switch to an Apple the next time we need a new computer. He thought it would be better for my artwork. Lucy's looking mighty snazzy! I've always thought that Apple products had great esthetic design, even though I've always had PCs. Thanks for indulging me, Cindy! It truly is beatiful and Lucy is adorable!!!!! Bwah hah ha....welcome over from the dark side, my dear friend. I've been a Mac Mamma since 1991, and have applified I don't know how many people around me through the years. They're just such great computers. Now I'm waiting to get an iPhone shortly. Congrats (and Lucy looks fantastic! Friends: this is the kitty that absolutely *must* be held and cuddled while one must do one's biological business at any point between midnight and 7am...she's simply adorable.